By Dominick J. Cirigliano & Paul Baldassano As Summer rapidly hits full stride, aquarists in the Tri-state area are presented with the annual opportunity to take advantage of a wide range of natural resources that, if well researched and properly understood, can yield interesting and beneficial results for our aquariums. What follows is an introduction to local collecting that represents the wisdom gleaned from decades of combined experience. It does, however, give us pause when we consider presenting this information as we are acutely aware of the potential for irresponsible abuses of our local flora and fauna. When something is acquired for free, there may be a tendency to treat it more casually than if it cost us our hard earned wages. It is this attitude that we hope to counter by providing accurate information on the care and proper handling of local marine species. These creatures deserve the same attention to their needs as any other aquarium inhabitant in our care. Toward this end, lets take a look at the specifics of our local marine environment paying close attention to both the similarities and differences of the conditions found in the tropical waters that the majority of our captive marine systems are designed to emulate. Local Waters of the Tri-State Area Our experience is primarily with the Long Island Sound, The Great South Bay and the Atlantic Ocean, and thus they will dominate our discussion. Suffice it to say that the types of parameters discussed below can be extrapolated to other areas in the region. The conditions of our local environment can be very different from those found in the tropical seas where most of our aquarium fish and corals originate. The issue of temperature is perhaps the most obvious difference, but one that needs to be addressed first and foremost. The temperature of our local environment ranges from somewhere around freezing in the winter to highs that resemble tropical waters in the summer (mainly tide-pools). The most important factor to understand is that the variable temperature is very important for our local fish and other marine organisms. Just because tide-pools can reach temperatures in excess of 80 degrees Fahrenheit, doesn’t mean that all marine organisms found in them will thrive long term in our tropical reef aquaria as these high temperatures are the rare seasonal exception and not the yearly average. Just because an animal can tolerate a physical parameter for a limited amount of time does not always indicate it can thrive under those conditions long term. The truth is that with a few exceptions, most of our local species require cooler waters for prolonged health. We host many crabs locally including the invasive Asian Shore Crab (Hemigrapus sanguineus). Another key element is the salinity. For example, the Long Island Sound in some parts can have a specific gravity (SG) in the 1.019 range and in other parts be as high as 1.025 or maybe even higher in tide=pools. Having tested the salinity levels of the Great South Bay and the Long Island Sound personally, it is quite amazing the variability of salinity even in the same location. This probably has to do with many factors including ocean current, distance from an estuary or even the weather. Most of our tropical reef aquariums’ SG are kept within the 1.023 – 1.026 range. Again, just because a local marine fish or invertebrate can be found in a SG equivalent to our home aquarium does not necessarily mean it can thrive in our tropical system. I’ll explain this in more detail later when we look at specific species of fish and invertebrates. 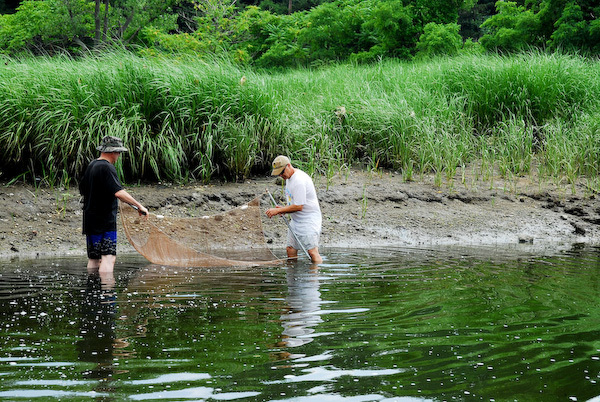 Our northern waters, especially in the Long Island Sound have mud bottoms unlike the sand of the tropics. This fine mud substrate is what gives our waters a brown dirty look. It is not pollution as popular belief suggests and given an hour to remain still, the mud settles and the water becomes clear. Our high tide rises about eight feet as a result of ocean currents and causes much of the mud to be suspended. This is an important difference between our local marine environment and that of many tropical habitats especially when considering benthic organisms. Fish not native to a sandy environment can develop scrapes and sores from the sand that can lead to infections and death. For brevity’s sake, we’ll forego a detailed look at other factors that differentiate our local environment from the tropical reefs of the world, but please be aware that we are dealing with highly complex ecosystems and the marine life that has developed in these specific niches has done so for reasons we need to attempt to understand and replicate in our aquaria if we plan on housing these fragile organisms. There are many fish found locally. Some adapt to captivity quite well, many others do not. Pictured is the Northern, Prionotus carolinus which requires special care. Local Marine Fish There is an abundance of marine fish found locally. We are even fortunate enough on occasion to host tropical strays towards the end of the summer. Since there is too many local marine fish to discuss in detail, We will focus on those that are most commonly caught and those that make suitable aquarium inhabitants. If you are interested in learning more Newsday.com provides a comprehensive list of marine fishes found in Long Island waters including tropical strays. The link can be found in the footer of this article. The most common fish found locally are theKillifish, Silversides and Sticklebacks. They seem to be the most abundant because they are easily accessible near shore or at boat docks and found in huge numbers. These fish with the exception of silversides tend to do quite well in captivity even at the higher temperatures of our tropical marine aquariums and they also stay relatively small. I’ve even had a few Mummichogs Fundulus heteroclitus give birth in captivity. These fish tend to be quite messy, aggressive eaters and they can easily dominate an aquarium. During breeding they can show a little coloration, but most of the time they are a light tan. Since these fish are commonly found near shore, they tend to be in “dirty” water and often are found with parasitic isopods, leaches and other fish-reliant organisms. The referral to “dirty” includes water polluted by boat traffic and run off. For these reasons, although a hardy fish, they are a high risk for inclusion into our expensive tropical marine aquariums, especially if they cannot be properly quarantined before introduction. One of my favorite fish found locally, the Northern Puffer Sphoeroides maculates, adapts quite well in captivity and can handle temperatures up into the low 80 degree Fahrenheit range with no ill effects. The Northern Puffer requires a sand bed to be totally happy as they spend their nights buried. Although attractive and interesting, these fish tend to be aggressive towards other tank mates and will eat any invertebrates. I haven’t seen them eat coral, but it would not surprise me as they are quick to pick at anything available. They also tend to grow near a foot long and sometimes even longer. They are probably better suited for a fish only marine tank with acceptable tank mates similar to other puffers. The Northern Puffer is commonly found near shore, so the entire parasite and pollution risk is carried with them as well. Quarantine is a must if you are considering one of these fish for your home aquarium. Northern Sea Robins Prionotus carolinus are considered a pest by many local fishermen as they are caught quite often when fishing off of piers or into the surf. 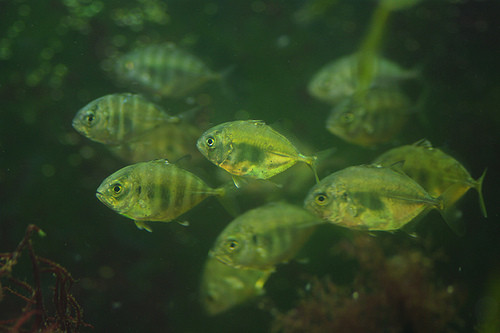 These fish are bottom dwelling fish although they are caught often in trolling nets. Their behavior and needs are very similar to the Flying Gurnard Dactyloptena orientalis. Unfortunately, the Sea Robin does not adapt well to high temperatures and is also prone to ich infection. They can also get quite large and would need a species specific tank with cooler water (max 70 degrees Fahrenheit) and a large open space with a sand bed. These fish are voracious feeders as well. Anything that can fit in their mouth is fair game. This fish is not well suited for our tropical marine aquariums. Another fish commonly caught by fisherman that has a rather odd reputation for being quite loud during mating season is the Oyster Toadfish Opsanus tau. The Oyster Toadfish adapts quite well to captivity and also can handle temperatures in the upper 70 degree Fahrenheit range. These Toadfish are not considered attractive, but are quite interesting. 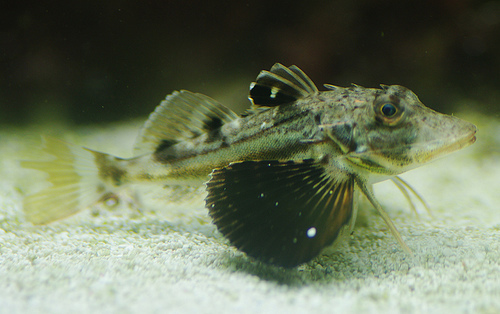 Also voracious feeders like Sea robins, the Oyster Toadfish will eat fish and invertebrates. They need plenty of hiding places and are quite shy. Other than viewing at night, you will most likely only see these fish when food is present. As with many local species, they also require a sand bed which they will happily rearrange on a daily basis to make themselves a den. Later in the summer when the water is warmer, Oyster Toadfish are commonly found near shore, so again, they carry the risk of pollution. Quarantine is a must for these fish as with all fish being introduced into the home aquarium. The Toadfish is considered a gamefish and is regulated (see DEC website). Since wrasses are quite common in the hobby I’ll discuss my experience with the Cunner Tautogolabrus adspersus and the Tautog Tautoga onitis. The Cunner can be found in many colors, but none as vibrant as their tropical cousins. This fish requires many hiding places and is quite aggressive especially towards other wrasses. The Cunner can get quite large (12” or more) so a larger aquarium is necessary for them to grow fully. They will adapt well to warmer water, but not temperatures that exceed 78 degrees. They are notorious for killing invertebrates, so I wouldn’t classify them as reef safe. The Tautog is a gamefish so please see the DEC website for details. 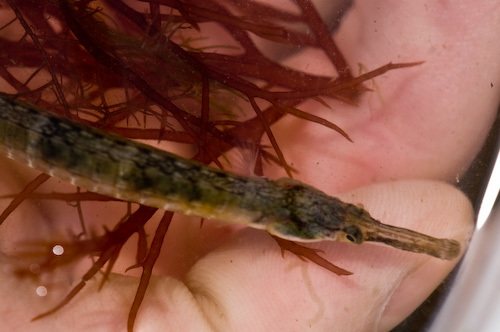 Northern Pipefish (Syngnathus fucus) are abundant locally, but do not adapt to captivity well. They require special care and are one of the local species that is better off left in its natural environment. Seahorses and pipefish are some of the most interesting fish found around the world. In general, seahorses and pipefish are recommended for the advanced aquarist because of their special needs and frequency with which they need to be fed. The local seahorse, The Lined Seahorse Hippocampus erectus, is no exception. Not only does it carry the basic care requirements that mark all seahorses, it also requires cooler temperatures to survive long-term. I would recommend a maximum of 75 degrees Fahrenheit, but it is probably best to keep them at 70 degrees Fahrenheit. The specific and complicated husbandry of keeping seahorses is beyond the scope of this article, but please be advised that in depth research is required to succeed with these tempting yet delicate creatures. The Northern Pipefish Syngnathus fuscus is abundant in our local waters and found in a range of salinities. The Northern Pipefish’s behavior is very similar to the Dragonface Pipefish Corythoichthys haematopterus. This fish requires a sand bed as well as rock work for hiding places. This pipefish cannot tolerate high temperatures for long periods of time. Although found quite often stranded in tide-pools in which the temperature can get up over 80 degrees Fahrenheit, it is only a short term adaptation to that temperature. Long term exposure to temperatures above 70 degrees Fahrenheit shortens the lifespan of this fish considerably as well as accelerating its metabolism (there may be a direct relationship between the two). In temperatures over 70 degrees Fahrenheit, this fish will need to eat almost constantly and will waste away in a few weeks. I would not consider these fish unless you have done your research and can provide an adequate habitat while quarantining them properly. The Naked Goby Gobiosoma bosc is quite common in the summer months. They can be found near shore especially near boat docks and ramps. This fish adapts quite well to our tropical aquariums and remains quite small. Their behavior is very similar to Neon Gobies Elacatinus oceanops except I haven’t noticed any cleaning behavior. They will easily take to some of the commonly available frozen foods such as mysis shrimp. Once again, quarantine is a must and because of their small size, caution should be taken when considering tank mates. Another sculpin, the GrubbyMyoxocephalus aenaeus is found most often near docks or within macro algae. This fish stays small and can handle higher temperatures, but special care is required when acclimating. This fish is especially sensitive to quick and large changes in temperature. Like all sculpins, it will eat anything that will fit in its mouth. The American Eel Anguilla rostrata is abundant locally and can be found in fresh, brackish and marine waters. American eels can adapt to a multitude of environments and do quite well in captivity. They can outgrow the average marine aquarium in a short period of time. They are aggressive eaters and will eat fish and invertebrates. Often used as fish bait, there have been discussions of the impact the fishing industry is having on wild populations of this eel. Tropical Strays Perhaps of greatest interest to aquarists is the surprising abundance of tropical strays that are common in the later summer months. Many butterflies, angels, triggers, jacks, filefish, puffers, sculpins, and others make their way into our local waters as they get caught up in pockets of tropical water that makes it way up the east coast in the Gulf Stream. Unfortunately for them, this is a one way ticket because as the water cools, these fish perish. However, their misfortune can be our gain as many of these species are viable aquarium inhabitants whose collection has no impact on either the local or reef environment whatsoever. This may be the most responsible way to collect fish due to this rare circumstance. Even though these fish are tropical and may be able to adapt to our reef aquariums quite well, it is still important to research the types of species available before collection. For example, a Bluespotted Cornetfish Fistularia tabacaria might be attractive, but they can get about 5 feet long. Not only that, it is very likely that these fish will require a live diet throughout their lifespan making it quite a chore to take care of properly—something many aquarists are best off avoiding. Some of the fish I have personally collected are Lookdowns Selene vomer, Orange Filefish Aluterus schoepfi, Short Bigeye Pristigenys alta, Scrawled Filefish Aluterus scriptus, Bluespotted cornetfish Fistularia tabacaria, Red Grouper Epinephelus morio, Cobia Rachycentron canadum, and Crevalle Jacks Caranx hippos. There are reports of people collecting Spotfin Butterflies Chaetodon ocellatus, PermitTrichanotus falcatus, Banded Rudderfish Seriola zonata, Blue Tang Acanthurus coeruleus, Lionfish Pterois volitans, and many others including angels and triggers. The Burrfish or Spiny Boxfish Chilomycterus schoepfi is now being researched as it was once believed to be a tropical stray, but some experts now think their appearance in our waters is part of the fishes natural migration for spawning. I have found that many of the tropicals I’ve caught locally have lesions or scrapes and are not entirely healthy. This is most likely due to the wear of an environment that these fish are not accustomed to. As with all stressed or ill fish, a quarantine tank is a must for observation purposes. Even if you were bold enough to accept the risk of introducing parasites or disease into your reef aquarium, it is likely the ill fish will be picked on by others and will ultimately die. Using a seine net to collect these fish can be a lot of fun and I enjoy going to the beach with some friends and spending the day hoping to collect a rare tropical stray. It is very easy to be responsible and enjoy the sight of a fish not equipped for an aquarium by taking a picture and sending it back on its way. Another way to keep the collecting of tropicals responsible is to contact your local aquarium and ask if there is any interest in some of the tropical fish you might catch. That is a win-win situation for the aquarium and the fish. Local Invertebrates There are many invertebrates found locally that are of interest. The Grass Shrimp Palaemonetes pugio is one of the most abundant and can be found all year round although numbers are diminished in the winter. These shrimp can adapt well to tropical conditions with caution. 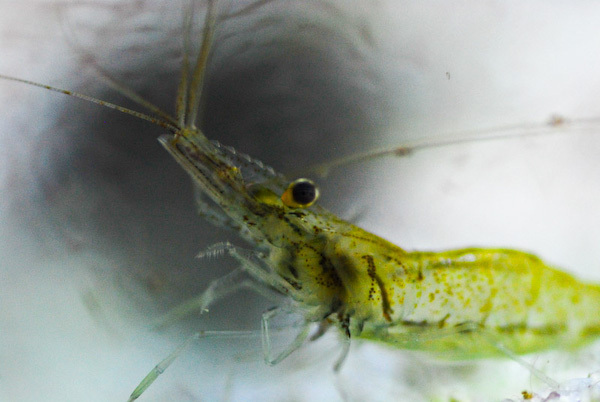 The behavior of the Grass Shrimp is similar to the peppermint shrimp. They also make good food for fish that require a live diet. The grass shrimp will readily accept flake and frozen foods so “gut loading” them is rather easy. 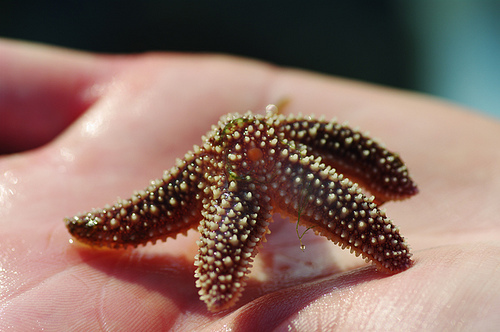 The Asteriid Sea Starfish Asterias forbesii is commonly found near docks and boat ramps especially on the east end of Long Island. These starfish cannot tolerate waters warmer than 70 degrees Fahrenheit for too long and anything near 80 degrees Fahrenheit or higher is almost instantly lethal. These starfish are not good tank inhabitants because they get quite large and also eat snails, mussels, and clams. They cannot live on detritus like many of their tropical cousins. The Atlantic Purple Sea Urchin Arbacia punctulata is common in the summer months. There are reports that these urchins can handle water temperatures in the upper 70’s to the low 80’s (82 degree max) for up to a year. Based on my experience, I recommend keeping them in cooler waters similar to the Asteriid Starfish. These urchins will eat coral polyps when given the opportunity. Many invertebrates are specialized to our local environment. Asteriid Stafish (Asterias forbesii ) require cooler water to thrive. Warmer water is fatal to this beautiful species. There are many small anemones found locally and I’d recommend avoiding them all. If they can tolerate the warmer temperature of a tropical marine tank, they will most certainly spread and become problematic. In addition to the anemones, it is best not to collect sea slugs. They are specialized feeders and in most cases it is not known what they eat. Many of our local species eat anemones and hydroids which makes them impractical to keep. There are a couple of common hermit crabs like the large Flat-Clawed Hermit Crab Pagurus pollicaris and the smaller Long-Clawed Hermit Crab Pagurus longicarpus. Both species cannot tolerate tropical temperatures long-term. They may survive for a few weeks, but not much longer. 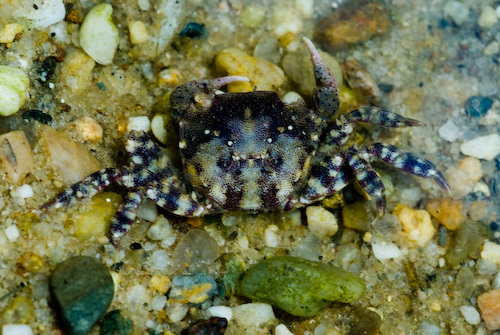 The Flat Claw Hermit sifts through sand but is large enough to catch and eat fish which it will do. The Periwinkle Littorina littorea mainly eats macro algae so it becomes difficult to feed properly. There are conflicting reports on whether these snails can tolerate the warmer temperatures of our marine aquariums and are best avoided. they do not adapt to captivity well and have special requirements that many hobbyists can not meet. They are best enjoyed in their natural habitat. Horseshoe Crabs Limulus polyphemus are very common in the shallows during the summer sometimes venturing into an inch of water or less. They often are found burrowing into the sand or mud searching for food. 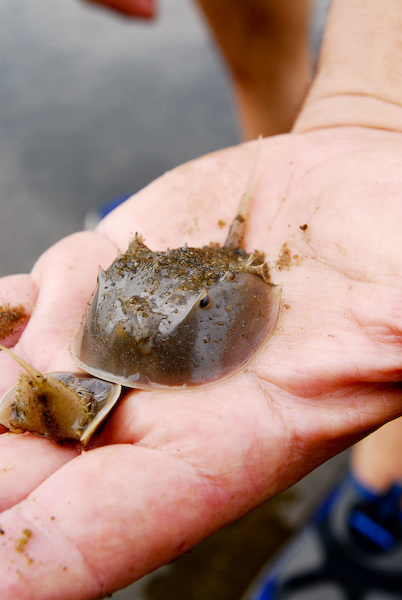 Horseshoe Crabs are also important in medical research. Although easy to catch, these crabs do not adjust well to a reef tank or any warmer water system. Unfortunately, many local fish stores offer them for sale. It is best to simply enjoy them in their natural environment. The Sand Fiddler Crab Uca pugilator is abundant where mudflats are found. Fiddler Crabs are suited for a special tank that is mostly wet sand with a little pool of water where they can wet their gills. They are opportunistic feeders and will also prey on each other. A juvenile Asian Shore Crab (Hemigrapus sanguineus) hitching a ride. A couple of non-native or “invasive” species is the Asian Shore Crab Hemigrapsus sanguineus and the Mud snail Potamopyrgus antipodarum. They both handle tropical environments quite well. The Asian shore crab will eat anything it can get in its claws. It is also important to note that these crabs can and will climb out of aquariums. The mud snails’ behavior is similar to the Nassarius Snails Nassarius distortus and Nassarius vibex. They do a great job cleaning up detritus. They tend to carry hydroids on their shells so be careful if you do add them to a tropical tank as there are some local hydroids that will spread rapidly in a tropical environment. These snails need a sand bed for survival. 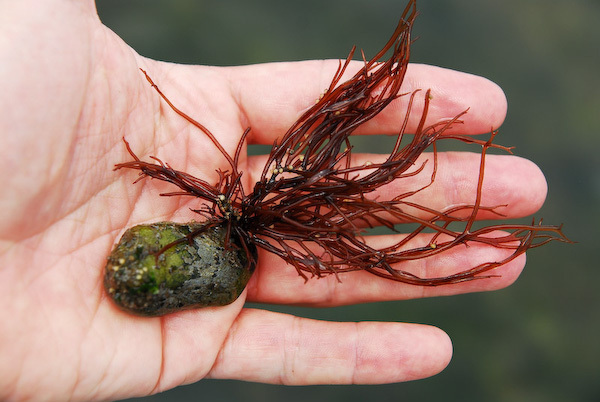 There are many macro algae species found locally, but only a few adapt well to warmer waters. Macro Algae There are numerous types of macro algae found locally. I do not have experience with a lot of them with the exception of Agardhiella tenera. This algae grows rapidly and can handle the tropical environment well. Lighting needs to be moderate though. I have found it grows best with 6700K compact fluorescent bulbs. As mentioned quite a few times previously and important enough to highlight one more time, all of these marine fish, inverts and even the macro algae carry many risks with them especially when introduced to a tropical marine aquarium. In a lot of cases they carry parasites and bacteria that may cause illness or death to tropical marine organisms and can also carry pollutants from local waters. 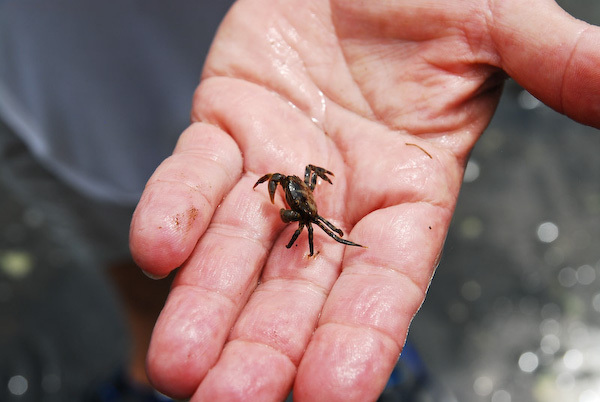 If you are interested in keeping local marine life, I’d recommend researching the specific husbandry requirements of the species you would like to keep, the proper quarantine methods to use and whether or not you are able to provide the proper habitat. There are many members of Manhattan Reefs that have true experience with local species and can be sought out for advice. Just make sure you seek this advice before you go collecting.